The first press founded by Elizabeth Yeats was named for the Lady Emer, renowned in the Irish epics for her beauty and artistic skills. The intent was to provide training for young women in a number of occupations by which they might earn their living, including bookbinding, weaving, embroidery, and printing. She was aided in this enterprise by a woman named Evelyn Gleeson -- who offered her large house in Dundrum, near Dublin, in which the group could live and work -- and by her sister Lily, a skilled needleworker. The press later moved to Dublin and was re-named Cuala. Yeats had been a member of William Morris's circle in London, and was inspired by his social and political ideas, and more generally by both the Arts and Crafts revival and the Celtic Renaissance of the late nineteenth century. Such ideals meant she was perpetually short of funds, but she did manage to publish fine editions of many Irish writers of the period -- including the works of her brother William Butler Yeats -- over the more than thirty years the Dun Emer and Cuala presses were in operation. Her work is simple, almost austere, but beautifully made. The Dun Emer press-room, ca. 1903. 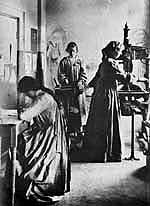 Elizabeth Corbet Yeats is at the iron hand-press; Beatrice Cassidy, standing, is rolling out ink, and Esther Ryan is correcting proofs at the table. The rear wall of the press-room displays a mural in pastel by the poet and artist AE (George Russell). 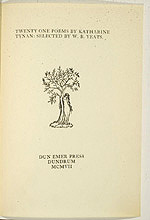 Twenty One Poems by Katharine Tynan: selected by W. B. Yeats, Dundrum: Dun Emer Press, 1907. 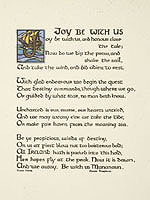 From the colophon: "printed upon paper made in Ireland by Elizabeth C. Yeats, Esther Ryan and Beatrice Cassidy, and published by Elizabeth Corbet Yeats"
Joy Be With Us, by James Stephens. Dublin: Cuala Press, ca. 1930. Broadside, hand-colored initial by Elizabeth Corbet Yeats, signed with her initials, lower left.